Arahne CAD/CAM for weaving | Do programs ever grow up? Do programs ever grow up? Arahne CAD/CAM for weaving / News / Do programs ever grow up? Like children, sometimes they do, and parents are proud, if they go out in the world and do big things. At the end of September 2014, we have dropped the “beta” label from the new ArahPaint5. This means that we think it is good enough for production use. 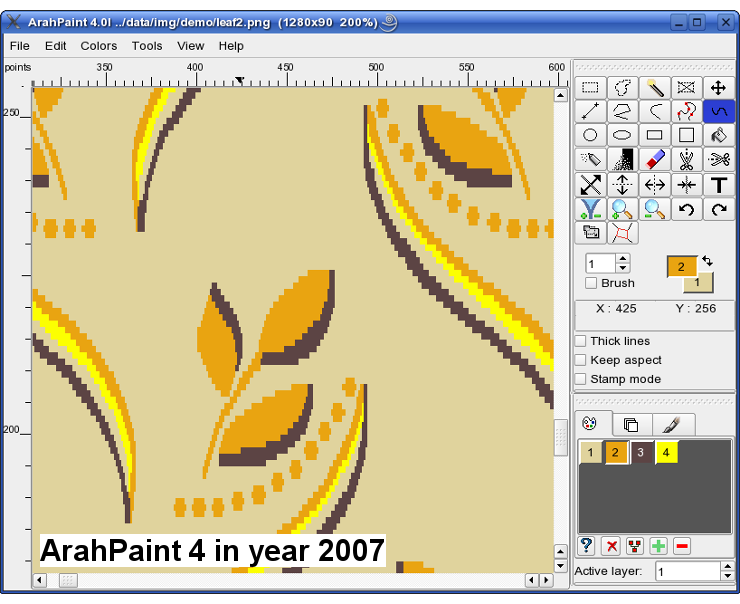 ArahPaint5 was more than three years in the making; it was supposed to be small evolution from ArahPaint4. Technically speaking, we have just ported it from Qt3 to Qt4 toolkit (programming library which helps us make buttons, menus, draw points on screen). In doing so, we eliminated the dependency on X Window graphics toolkit, so that program could be ported to other platforms than Linux/Unix. Sound wonderful. But we have almost thrown away the baby with the bathwater. The careful speed optimizations, which worked only on Linux, had to be eliminated and replaced with generic toolkit code. The once snappy program became dog slow. What is the big change from the previous beta versions? 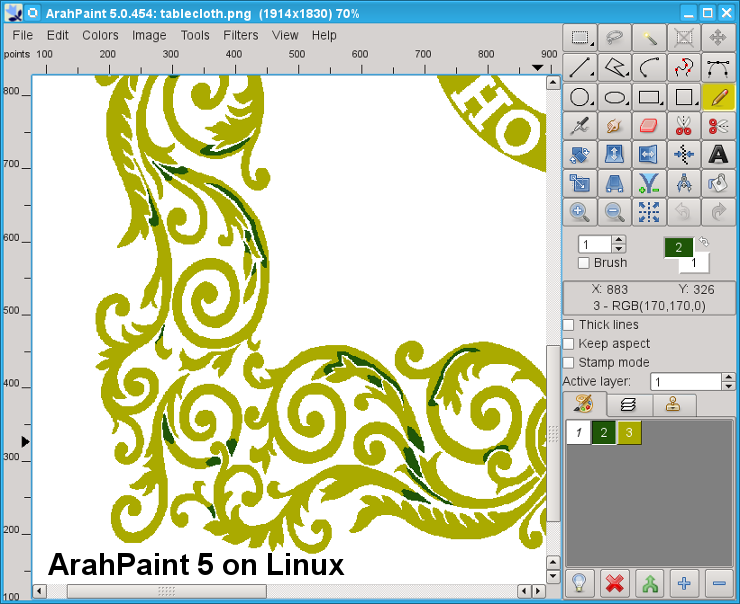 ArahPaint5 can now handle big images well. 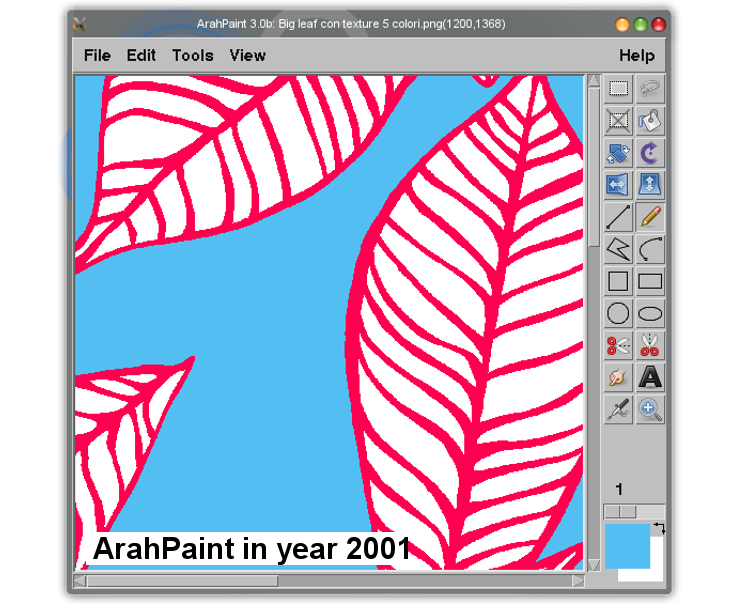 Before ArahPaint 5.0.445, the bigger the image, the slower the drawing. It worked nicely on 1000×1000, slower on 3000×3000, while at 100000×10000 resolution, the drawing speed was reduced to useless crawl. You could literally see the mouse pointer not being able to follow your movements. 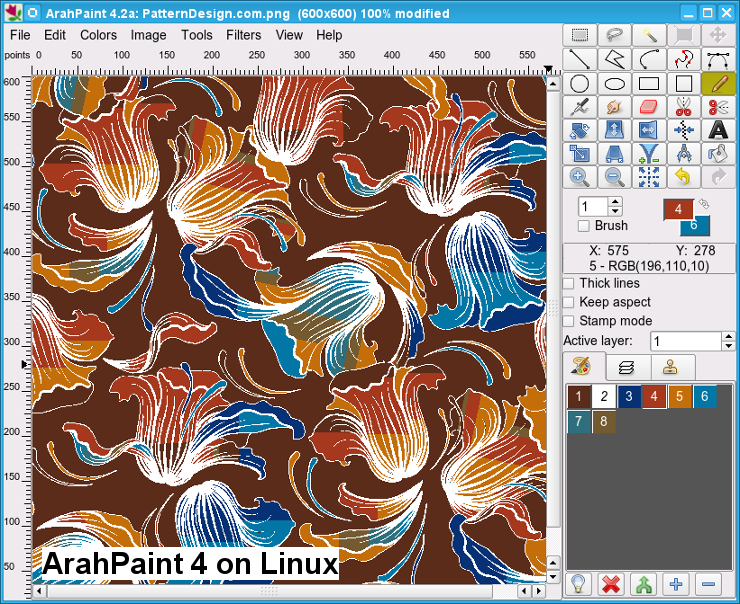 This problem was especially painful, as ArahPaint4 did not have this issue. 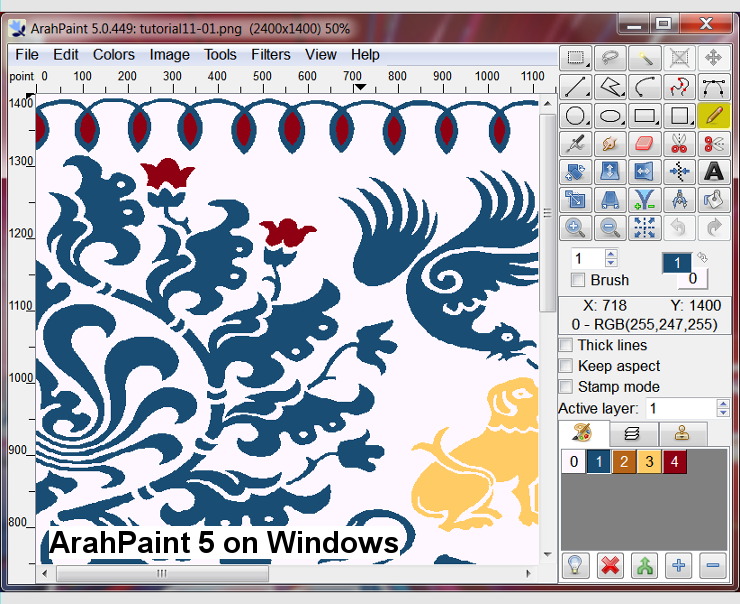 So existing users, used to fast work, did not want to use ArahPaint5 at all. completely redesigned resize dialog, which nicely handles conversion between size in mm/inches/pixels and threads/cm/inches. Simon Weilguny for writing the first ArahPaint 2.x using Motif toolkit in C on UnixWare and later on Linux. 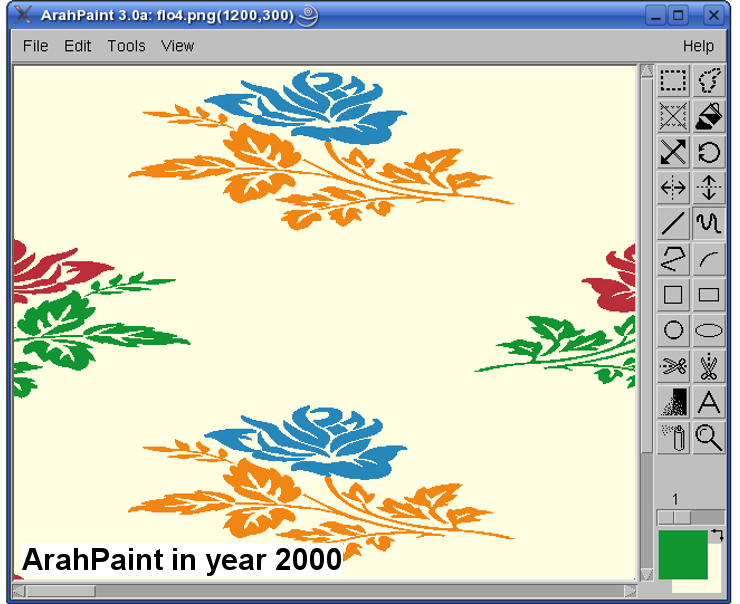 Matjaž Gutenberger for rewriting the program as ArahPaint4 using Qt toolkit in C++ on Linux. Peter Kovář for fixing the ruler. Zoran Pavlović for finding and managing programers in Belgrade, and for providing cosy work environment during meetings. If we missed somebody or if someone’s contribution was misrepresented, send us a note and we will correct it. 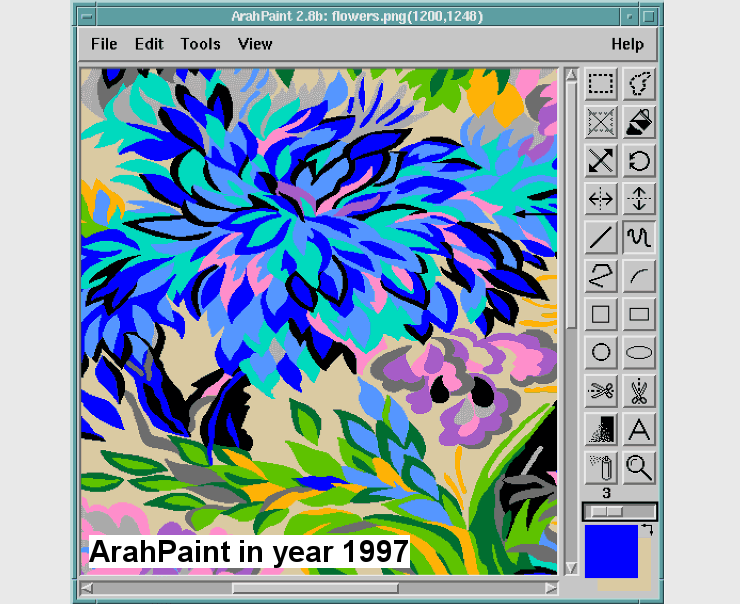 So is ArahPaint now a big program? It is not an intergalactic success like Photoshop or Gimp. But it does serve its niche of textile design.It is used by thousands of designers every day. It is available on all major operating systems, translated in 13 languages, It has survived the test of time, and got several facelifts to stay attractive. So please download it, is is free, and if you like it, recommend it to friends. Here is a little gallery of ArahPaint’s evolution. Copyright © 2018 Arahne d.o.o., All rights reserved. Designed & developed by 4WEB d.o.o.